Wandering through the caves of Capri and the Amalfi Coast, I can almost hear the Sirens that Homer mentioned when he wrote The Odyssey. Ulysses knew that he couldn’t stop even his most stoic sailors from succumbing to the luring song of the sirens. As the ships sailed by, he ordered his sailors to fill their ears with wax as to not hear the seducing songs. Ulysses himself, however, wanted to hear the sirens’ beautiful voices so he tied himself to the ships mast so that he couldn’t escape. Roman writers also suggest that the sirens are daughters of Phorcys, the God of the Sea. They sang sad and sweet songs to lure in sailors, but always with a deadly result. It is here on the Amalfi Coast where the myth seems to become reality. Riding along the shores of Capri, I explored the rocky coast, hidden caves, and deep blue crystal clear waters that these fabled sailors passed through. 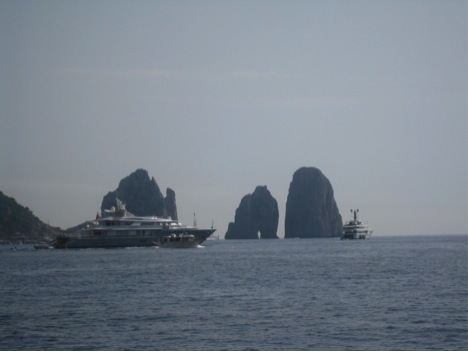 I sailed until I reached the blue grotto, or Grotta Azzurra. The Blue Grotto is a small cave on the Island of Capri that reflects the most pristine and piercing blue light that I have ever seen. There is a very small hole that is the entryway, allowing light into the grotto. The large surrounding walls/rocks don’t reach the sea floor, which in turn allows sunlight to reflect underneath the water creating this mesmerizing blue effect in the cave. 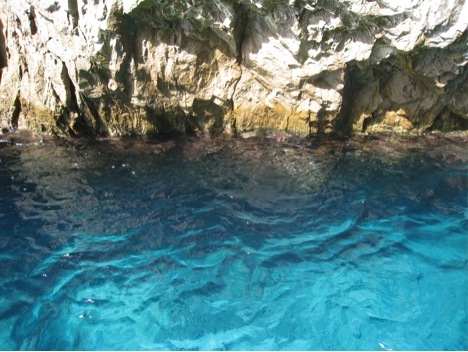 The Blue Grotto is said to have been the private bath of Emperor Tiberius. It was later said by the island’s sailors to be haunted by evil spirits, therefore it remained largely untouched. By 1826 the Blue Grotto was rediscovered by German painter August Kopisch and since then has become a major attraction with people all over the world travelling to get a glimpse. A dear friend from New York came to visit me last week and it was the perfect excuse to take a trip to this famed wonder. My experience was one of comedy, terror, and awe. 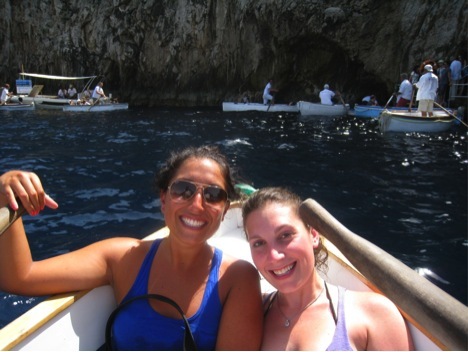 It began by the two of us sliding into a small rowboat with a Native Caprese sailor rowing us into the cave. I was smushed like a sardine in a little rowboat next to my friend, lying on my back, looking up at the sailor as he tried to navigate this little rowboat over the rolling waves and into the cave’s tiny entrance. The boat smashed into the sides of the rocks and water splashed onto our faces. “This is it”, I thought. “I’m going to die on my way into the Blue Grotto”. The sailor was holding on tight to a thick metal chain that was attached to the inside of the grotto, ready to force the boat through the hole. “C’e la facciamo justo justo”…. “We will just about fit”, he was saying to us. All of a sudden I heard a bang, felt the boat surge forward, and then we were engulfed in darkness. I opened my eyes and saw the most intense blue light I had ever seen shining up through the water. “Hurry, jump! Hurry Hurry!” The fisherman was saying in a “whisper-scream”, as swimming in the grotto is strictly forbidden. The next thing I knew, I was flying through the air and into the water. I popped up and looked around. 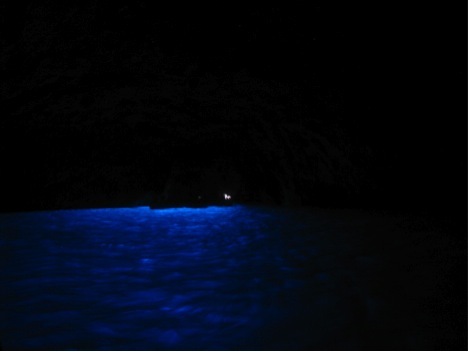 I was the only one swimming in this dark cave with blue light shining all around me. Another splash and my friend was bobbing next to me. I was terrified of what sea creatures may have been swimming below, but excited about the fact that I was submerged in this electrifying grotto. Suddenly, I was being pulled up by my arms and into the rocking rowboat. I had to lay flat again and we were pushed back into the real world and bright sunlight by a giant wave and a yank of the chain. Looking back, it was two minutes of sheer panic and laughter all rolled into one. It’s not what one might think of when traveling to the luxurious and mythical island of Capri, but it was an experience that I will always remember fondly. 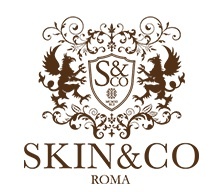 Valeria Carrano is Fashion Director & Contributing Columnist for Italia Living. To learn more about her, visit our About Us page. How to Make Tagliatelle by Hand…ValeriaStyle! Italian Fashion and Food in Manhattan…ValeriaStyle!